Twin cities Mahila Arogya Vikas Coordinator Smt. 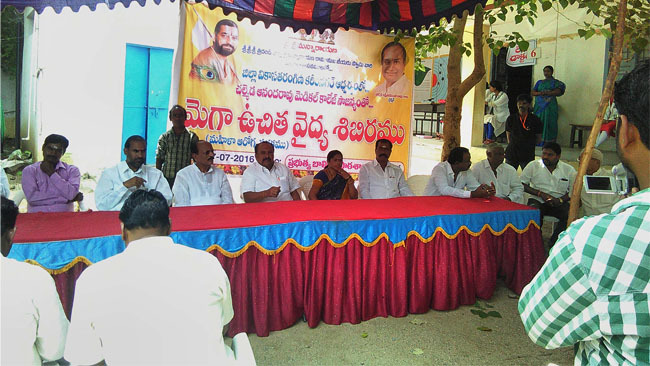 Suneetha garu and her group conducted cancer awareness camp in Kukatpalli on 30/11/15. Sai Baba Temple chairman Mr. Dhanaraj garu, other members and pujari garu Mr. Sri Ranga Krishnamacharullu garu organised the camp. Dr. Sai Divya garu extended her services in the camp. 9 Patients of previous camp were also checked for second opinion in which 3 of them were forwarded for biopsy and one case for scanning. In this camp christian Mr. Rathna Raju garu extended his services and felt good. He promised to extend his services in the upcoming camps also. Vikas Tarangini Secretary Smt. Vanaja Chalapathi garu and Mahila Arogya Vikas members Smt. Padmasri garu, Smt. Usha Rani garu, Smt. Padma garu, Smt. Nirmala garu, Smt. Tulasi garu and Smt. Sujatha garu extended their services in the camp. Below are the statistics .